Featured Image: Railways minister Suresh Prabhu (extreme left corner) speaking at the event at Howrah station’s new complex on Friday. Kolkata, 08 January: AFTER a delay of nearly four years, the digging of tunnel for East-West Metro Corridor from Howrah-end formally commenced today. The 14.67 km East-West Metro Corridor is to connect Howrah Maidan to Salt Lake Sector V.
From Howrah Maidan, the tunnel will cross over to the Kolkata-end by moving about 10 metre deep under the Hooghly river bed. It will than get linked to Sealdah, where the stretch coming from Salt Lake Sector V will converge. In a ceremony organised at Howrah station’s new complex today, Railways minister Suresh Prabhu formally commenced the tunnel digging work by signalling the lowering of a German-made tunnel-boring machine that is to dig the tunnel. It will take about three months from now for the machine to start the actual digging work, that is, the digging will start from March-end. 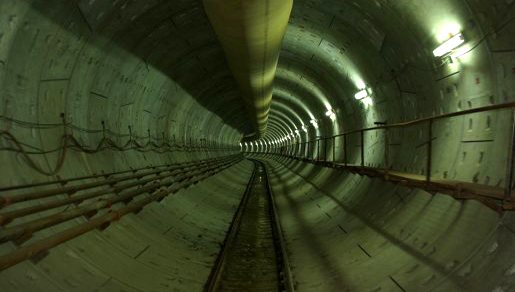 East-West Metro tunnel that is already complete at Phoolbagan off Sealdah station. File photo. The machine will then take at least four months or until July to dig the little over one km long stretch up to the Hooghly river bank near the Howrah railway station. From there, the tunnel will be dug 10 metre deep under the river bed reaching the Kolkata city-end near Strand Road-Brabourne Road junction. Sources in the Kolkata Metro Rail Corporation Ltd, which is now fully an arm of the Indian Railways implementing the project, said that the near 5.14 km tunnel boring work from Howrah Maidan to Sealdah will be completed by 2019. Railways minister Prabhu, on the other hand, today said that the Salt Lake Sector V to Sealdah stretch (around 9 km) of the East-West Metro Corridor will be thrown open to trains in 2018.